What goes on in our neighbourhoods is often a signal of what is going on in our countries and our regions, in terms of how we are integrating sustainable energy into our lives. EiDtakes you through parts of Montmartre (and maybe even greater Paris) to show some of those telling signs – both good and not so good. Follow the footsteps . . .How does it relate to your neighbourhood? Look what I see on my street. Two important items in one photo. First, the city hall says there is now a rubbish bin every 100 metres in the city. So far I can’t fault them. But I’m trying. Second, see the old refrigerator. It is obviously replaced by a top category (A+ or so) refrigerator! 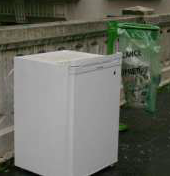 Also important is that you can call or email city hall and arrange to have items like fridges picked up within 24 hours. Another step . . . There are bike lanes (almost) everywhere. It isn’t Copenhagen but it is trying. 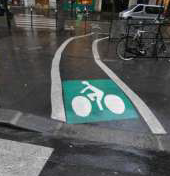 Plus, in our neighbourhood, all one way streets have been signposted to allow for bicycles to go against the traffic. If you dare! And to help you on your way, there are bikes you can rent or borrow. Near the EiD office, there are several of these bike stations. But it isn’t all great . . .
Look at this café. No one even sitting there and the heat is blasting away. And this is happening more and more… There is one café that has put out blankets for customers (and no heaters). I’ll try and sneak a photo soon. And almost next door . . .
A small corner store selling wood and bottled gas. Hard to imagine in the middle of Paris but, yes, it does happen. And almost across from him is this . . .
Motorbikes and scooters are everywhere and even promoted by the city. I’m not impressed by the noise or the air quality but I have yet to see a study to show whether in aggregate they are better or worse than cars. To me they are a menace but I remain open minded and maybe one of you can set me straight. To complement the bikes . 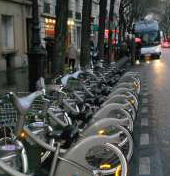 . .
Paris has recently started a similar service for electric vehicles. It is called Autolib’. There are several such locations in my neighbourhood. What is interesting is that owners of electric vehicles can also use the recharge stations. That comes at a cost of €15 per month or €180 per year. Going solar . . . sort of . . . This is the van of EiD‘s local plumber, Daniel. Notice that he offers to install solar hot water systems in our neighbourhood. EiD has not seen any yet, but we’re on the look out for one. Croissant anyone . . . There are many bakeries in Montmartre but this has to be one of the most beautiful. You have probably seen it in the 2009 movie Julie & Julia, starring Meryl Streep. If you take a good look at it, you notice that the bottom boards are in a terrible condition and the leakage must be terrible. The question is whether this bakery, if it had been at the highest energy performance, would have continued to look like this and be used in the movie. Any comments? The transition is on . . . This has been our local service station for decades. It has now closed. It would be nice to think it was because of the electric cars and the bicycles but, alas, we see so many motorcycles and, yes, cars that locals are obviously buying it somewhere. Cleaner air . . . If you come to Montmartre on a Sunday or on a national holiday, you will see that the streets are closed for most of the day to let the locals have cleaner air. It really does work. Only locals are allowed to drive home. Not even motorbikes are allowed in. It really has made a difference. But bicycles are, if the person is fit enough to tackle the hill. Alas, Sunday night and Montmartre is back to normal. Rubbish collection is every day in Paris. On on May 1st, labour day, is there no collection. The bins with the yellow tops are for recycling and in our building, they are only collected twice a week. There is a big parade of garbage collectors in the morning, so if you have to rush out by car, there is a need to beat them, otherwise it can be a long, stinky wait. 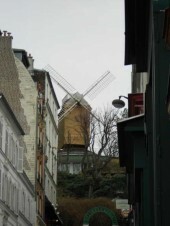 Wind power in Montmartre . . .
Montmartre used to have between 15 and 30 windmills. Some were for milling grain, some for crushing flint and some for ventilation for the gypsum mines. Alas, our memories go back to the Moulin de la Galette made famous by Renoir, Picasso and others. There is one typical “moulin” left, although not functioning and it at the site of the famous old dance hall. And, mais oui!, only a couple of hundred metres away is the famous Moulin Rouge! Renewing the facades . . . 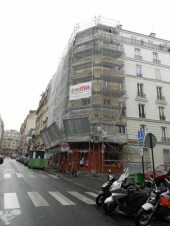 Since 1965, Parisians have had to ensure that the facade of their buildings is in a good shape. This includes ensuring the facade is clean, that the woodwork is freshly painted and that balconies and corners and drainage pipes are safe. The latest law says that this must be done every ten years. Talking to a local architect it seems such a waste that expensive scaffolding is put up and significant work is done, but concern for the building’s energy performance is not an obligation. What a wasted opportunity. Can you be too smart . . .
Avenue Junot is one of the wealthiest streets in Paris with rumours that Johnny Depp and Vanessa Paradis have a little pied-de-terre there. It is also one of the most beautiful streets in Montmartre (maybe all Paris) with bauhaus buildings and artist garrets. The street is only about 300 metres long but one day EiD staff counted 15 Smart cars parked. That doesn’t include the Minis and other small cars. Helping your purchase . . . There is a requirement to have an energy performance certificate now in Europe when selling or renting properties, although it is poorly used at the point of sale, unfortunately. Since the beginning of 2011 they have been mandatory for real estate agents to use them in their publicity. Energy Performance Certificate . . .
Public buildings are required to display an energy performance certificate, as mandated by the recast of the EU Energy Performance of Buildings Directive. This is required for all buildings larger than 500 square metres. That threshold will drop to 250 square metres in 2015. 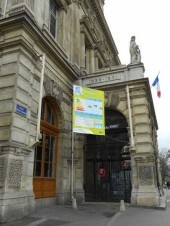 The city hall of the 18th district (arrondissement) of Paris (where Montmartre is and close to the EiD office) has gone all out with an enlarged certificate that hangs on the outside of the building. In the EiD neighbourhood, there are four re-cycling shops, all supported by a foundation related to the French post office. The products sold range from furniture to clothes, to appliances to CDs — and much more. 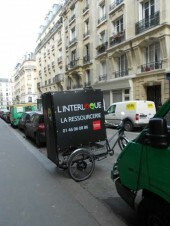 The organisation is quite innovative and will even come on bicycle to pick up articles from the neighbourhood. It gives a whole new meaning to re-“cycling”. Using waste heat, but . . .
Financial crises have brought some people to seek temporary shelter. In Montmartre, there are not many of these. This one is on top of a ventilation shaft for the metro. Alas, it isn’t that temporary. The one “resident” has been there two years — all four seasons. No matter how we define the term, this is not sustainable. Fill ‘er up . . . While there are electric cars that one can rent from the city of Paris, there are also places where one can charge your own electric vehicle. Here is one of the filling stations, with a car being charged. Daily sweep . . .
Montmartre is a major tourist area in Paris, but first of all it is a village for locals. The main sidewalks are swept daily. You will see in the photo that there is water flowing down the road. The sweepers take the water to clean the sidewalks. In the tourist areas, the sweepers are out at 6:30 a.m. every day to get the area ready for that day’s tourists. In the evening, there are many who sit in front of La Basilique du Sacré Coeur until all hours of the evening. They leave a tremendous mess. But by 9 a.m. all is taken care of. As I was walking in my neighbourhood this week (September), a local shopkeeper was filling up her electric car. Notice the electric cord into her shop. I do feel that the city is trying. It is so much more livable than during the mid 1990s, when cars would park with impunity on pedestrian walkways, the Vélib’ system didn’t work, most new vehicles were dirty diesels without particulate filters, and restaurants still allowed smoking indoors. Isn’t it ironic, though, that the smoking ban has led to so much more consumption of bottled gas for outdoor heaters? The city is trying but as we will see in future walks, there is still a way to go. The smoking ban has led to much more consumption of bottled gas and increasingly more electricity in many restaurants. There is one restaurant in Montmartre that has provided blankets, just as we see in cities like Copenhagen. Let’s see. Sorry. I mean “the Vélib’ system didn’t yet exist“!